ISLAMABAD: The Economic Coordination Committee (ECC) of the cabinet allowed on Wednesday import of petroleum coke (pet coke) from India for cement industry by road and took a notice of an increase in fertiliser prices. Pet coke is a by-product of the oil refining process. The pet coke import through Wagah-Attari by trucks was allowed on a request by the Federation of Pakistan Chambers of Commerce and Industry and the All Pakistan Cement Manufacturers Association. Pet coke is already importable from India via rail and sea routes. Presiding over a meeting of the ECC, Finance Minister Ishaq Dar came hard on federal secretaries for shying away from the media and preparing half-cooked summaries, resulting in negative perception of the government. He was critical of the secretaries who he said were producing summaries to the ECC without consulting their respective ministers, came to the meetings unprepared and then leaked information to the media that the finance minister was not taking interest in policy decisions. �The ECC shall not entertain any summary that is not cleared by the respective minister,� he was quoted as telling the secretaries. Mr Dar said the respective ministers and secretaries were also not taking notice of negative media reports and it was not practically possible for the finance minister to respond to every report. From now onwards, every ministry would be required to respond to the media reports within 24 hours. �If the media report is correct, the minister and secretary concerned should accept it and take remedial measures and if it is incorrect, a proper rejoinder should be issued to clarify the situation. But nothing should go unaddressed,� the minister said. He directed that the secretaries of economic ministries should come to the ECC meeting fully prepared with complete information and bring their cases before ECC after completing consultations with other divisions where necessary so that a timely decision can be made. The minister said that budgetary discipline should be maintained by all ministries and no cases for regular supplementary grant be moved unless critical. The secretaries shall be responsible to remain within the reduced budgetary allocation and exercise austerity, instead of moving cases for supplementary grants. He was particularly perturbed over a summary for provision of natural gas to Engro Fertiliser at lower rates that is reported have created opposition from Mari Gas Company and some other stakeholders and inability of the ports and shipping secretary to explain what kind of ships could operate through Gwadar port. Mr Dar asked the ministry of petroleum to frame a proper question to the law ministry and seek its legal opinion on contract with Engro, the pricing regime and the impact on Mari Gas revenues so that the ECC could take a decision. 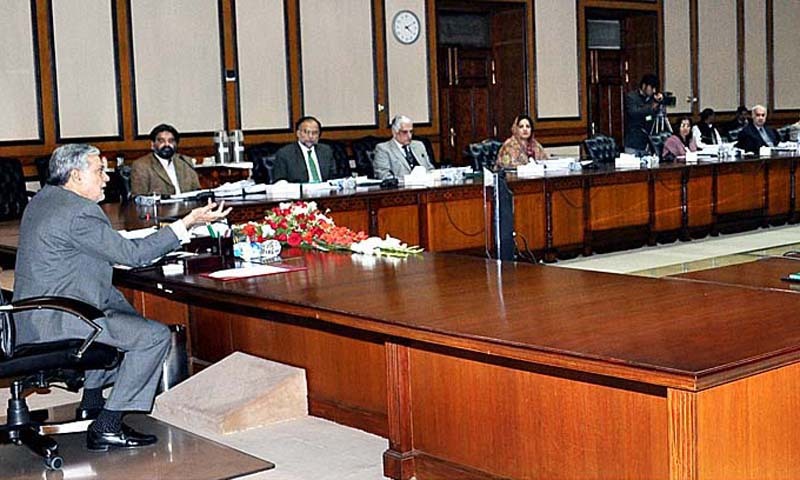 The minister for national food security and research informed the meeting that fertiliser companies had arbitrarily increased prices of urea by Rs150 per bag. The ECC took a serious notice of price increase and called a meeting with fertiliser companies on Friday to discuss the matter. The chairman of the Trading Corporation of Pakistan briefed the meeting on incidental and financial costs on imported urea from Karachi and Gwadar and said that against a credit line of Rs143 billion from various banks which is near exhaustion an additional amount of Rs122bn has accumulated on account of subsidy since 2004. Mr Dar raised serious objections over accumulation of dues of TCP and observed that officials should have brought the issue earlier and regretted that old liabilities of previous governments had been brought to the ECC. The meeting decided to constitute a committee headed by the minister for national food security with finance and commerce secretaries as its members to review the incidental cost on import of urea including the role of National Fertiliser Manufacturers Limited. The committee will also suggest steps for resolution of the issue. The ECC appreciated assistance of $1.86 million for purchase of wheat being provided by the World Food Programme for people affected by earthquake in Balochistan and its purchase from Passco at cost. The meeting decided to allow Lucky Cement Limited to remit $40m in four quarterly instalments of $10m each as equity investment from inter-bank market for setting up a cement manufacturing plant in Congo. The ECC had earlier allowed the company to purchase it from open market.